Biennial of the Americas Startup Story Friday. It's Father's Day, and I've been thinking about my dad this morning. Pop passed on November 15, 1979, he was just 55, far too young. I married in 1967 and started working full time in his business as print shop manager doing a weekly sales bulletin for the salesmen, the invoices and other forms, and creating signs and point-of-sale promotional materials. 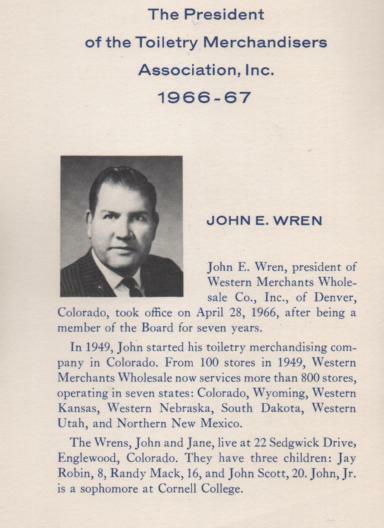 When I graduated from the University of Denver in 1969, at a sales meeting Pop gave me a 10 year service pin (I'd worked for him each summer starting in elementary school, you can imagine how much help I was when I was 11!) and he promoted me to personnel manager, housewares buyer, and corporate treasurer. Last night I was going through some papers and found the TMA directory for the meeting they had at the Dunes Hotel in Las Vegas in April, 1967 when dad served as President. That year I'd won the 1967 NCAA Mid-West Conference wrestling championship, but a Psychology 101 class had convinced me that I'd be much better off working for dad in his small company than becoming a cog in some bureaucracy. Also, Janet and I had decided to get married and Cornell College did not allow married students then. I've tried to think what Pop would want me to say to everyone today. I know he wouldn't want me to miss an opportunity to give a talk! Anyone who ever attended one of his sales meetings knows he believed in the power of sharing. One time his business partner Sam Newton who was the sales manager left and went home from one of the Saturday sales meetings, and dad kept talking with the salesmen for another two hours! I have many memories of Pop. The trips we took as a family to Disneyland and Hawaii and the World's Fairs in Seattle and Montreal and fishing in Twin Lakes and Granby and one summer in Yellow Stone Lake, and the business trips he and I took to Chicago, Miami, and New York. On all these trips, he was always teaching and giving advice. I can remember riding to and from work with him time after time, starting when I was just a little boy not so much working all day as playing on top of the tall stacks of boxes in the warehouse and drinking coffee with Eagle Brand Milk. And I remember the sales meetings, his monthly talk with the 100 or so men; those of us who got to hear him were very, very lucky. As a result of dad's influence and the profit sharing plan he and his partners had created early on, several of his employees went on to start successful businesses themselves. What I'm sharing with you today is some of the Pop's wisdom, in a way a chance for one last sales meeting with him. Dad would never waste an opportunity like this! Pop would have liked your sermon Bob (Bob Eli conducted the funeral service at Welshire Presbyterian Church, he was then Pastor at Trinity Methodist Church, he and dad had gone to school together in Amarillo). You encouraged everyone to use the tragic, all too soon death as a time to turn to Christ. Dad was no theologian, but Christ was a real and important foundation for his life. He urged me to go to church each Sunday. He read the bible. I think he waited to die until I'd found my faith in Christ, the greatest gift he ever gave me. Dad insisted on a positive outlook. "Be thankful for the good things in life." "As going through life, whatever be your goal/ Keep your eye upon the donut, and not upon the hole." He insisted there was always a good job available to anyone who wanted one. He was just a little boy selling Eskimo Pies from his wagon when he over heard two bums talking with each other and one said, "If anyone would offer me a job I'd take it." Even as a little boy dad could see the insanity of that statement. Pop's advice: "When you don't have a job, your job is to find a job," and "Take pride in your work. Always do your best!" And "The only difference between the boss and the worker is that the boss understands the value of thinking, of looking for a better way to do things." Pop knew the great value of families. He knew he could never have achieved the great success he did without moms help and support. She always had dinner on the table, he always had a clean shirt, she was a constant inspiration for him. Dad always wondered why he and I just couldn't work together. His ideal was the Jewish family that helped each other become successful. I think he liked that idea because he saw himself as the boss! Pop, we will miss you. Thanks for all the great memories and all the great lessons. In New Orleans they have a parade and celebrate when someone passes on. So let's do that now, let's celebrate this great life, and be thankful for it! Thank-you pop! To my surprise, everyone got up then and went and ate. I've always been disappointed that the others who were there didn't share more. Maybe they will now. Happy Father's Day, Pop! I love you.